France is usually not known for entrepreneurship. The 35 hour work week and hopes for a safe government job are the more typical stereotypes. Coming from entrepreneurial Silicon Valley, the last thing I expected to meet in the Provençal countryside are fellow entrepreneurs. Of course I should have known better. There is a recession in France, just like everywhere else. New grads coming out of school can’t find jobs, just like everywhere else. So they’re making opportunities for themselves. You may recall Diane’s earlier post regarding Ivan Des Pizzas, the owner, operator and chef of the local pizza truck. Ivan has all the traits of a true entrepreneur, truly dedicated to his business. His pizza truck visits a different village seven days a week, showing up at around 4:30pm until business stops at around 10pm or so. Judging by how busy he is, his business is thriving. School is off in France on Wednesdays. We like to use those days to take the girls and check out the area. We visited a nearby fortified medieval town, built in the 11th century. We saw many cool things, including an old church that had entombed some prominent nobles who passed away in 1650. 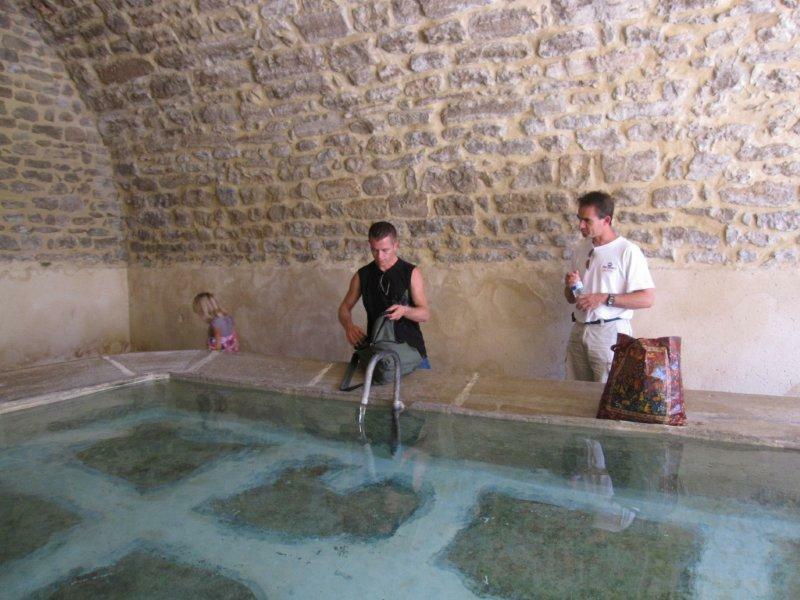 But to the girls, the highlight was meeting Luc at the “lavoir du village” – the town’s main fountain where in times past, people came to wash their clothes. Luc was there, with a large bag of tasty yellow beans that he had just picked. We started chatting, and of course, recognizing my French Canadian accent, he told me how he wanted to visit Montreal one of these days. But soon, his entrepreneurial instincts kicked in, and he offered to sell me a kilo of his yellow beans. 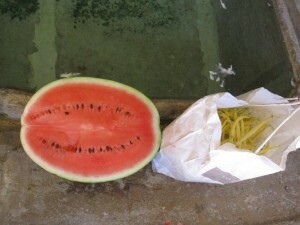 Once I showed interest, he then mentioned his super sweet and tasty pastèques (watermelons). The girls picked up on that, so for a few Euros, we got a kilo of beans and half a watermelon. But Luc’s entrepreneurial instinct didn’t stop there. He gave me his cell phone number, just in case we’d want freshly delivered vegetables every week – he’s only a phone call away. Mmm, freshly delivered vegetables – can’t knock that, I wouldn’t think. Luc and Ivan sound like the right people to know :). I imagine the main difference is in how big people think – so I could be completely off base of course but here in the Valley people think big and want to make millions and never stop until they achieve that (or until they’re dead 🙂 while in other places people are content with smaller businesses. Not saying either is better than the other… Just different. I did that in Costa Rica. There was a guy in a truck who drove around and sold produce out of the back of it, stopping at houses along the way. It felt totally decadent, not having to haul heavy grocery bags from store to car (or bike, as the case was) to home. I would so do the delivery!